Why Are So Many Countries Now Fighting Over Rocks in the South China Sea? Mel Gurtov is Professor of Political Science and International Studies in the Hatfield School of Government, Portland State University, and Editor-in-Chief of Asian Perspective. His most recent books are "Superpower on Crusade: The Bush Doctrine in US Foreign Policy" and "Global Politics in the Human Interest," both available from Lynne Rienner Publishers (www.rienner.com). Trouble is again brewing in the South China Sea (SCS), where six nations compete for control over tiny atolls—the Paracel and Spratly Islands—that probably sit atop important gas and oil reserves. On the surface the dispute over sovereignty would appear to be about two kinds of claims, one based on history, the other on international law—200nm exclusive economic zones (EEZ) and territorial waters that a country may legally claim under the 1982 United Nations Convention on the Law of the Sea (UNCLOS). In reality, however, the dispute has more to do with politics and economics—motives based on nationalism, power, and energy needs. Without such motives, the territorial dispute would stand a good chance of being quietly resolved through diplomacy or adjudication; with them, the dispute stands a good chance of leading to serious conflict. The recent history of the South China Sea shows that escalation of the dispute may be just around the corner. In recent years, periodic claim-maintaining activities—landings of personnel on particular islands, contracts with international oil companies, detention of fishermen, deployments of ships, and interference with other parties’ vessels—have repeatedly undermined opportunities for dialogue. The latest and most provocative acts have occurred in different sectors of the SCS. In one, the Philippines arrested eleven Chinese fishermen in disputed waters and seized their boat. At this writing they have not been released. In the other, which has received far more international attention, China stationed a giant oil rig inside Vietnam’s claimed EEZ, supported by a large number of military vessels. The two governments traded accusations about the ramming of their boats. Large anti-Chinese demonstrations by workers in Vietnam cascading into the destruction of Chinese factories envenomed the situation. The Vietnamese government put a stop to them after a week in which well over 100 Chinese workers were hurt (about 3,000 were evacuated home) and some Taiwanese businesses as well as PRC businesses suffered heavy damage. Each of the parties takes the public position that it has a superior claim to all (China) or some of the islands (Vietnam and the Philippines among other claimants); hopes that other parties will refrain from unilateral action to change the existing status; and urges peaceful resolution of the issue. But the actual situation is quite dangerous as the parties trade warnings and engage in shows of force at sea rather than resort to private conflict-prevention efforts. 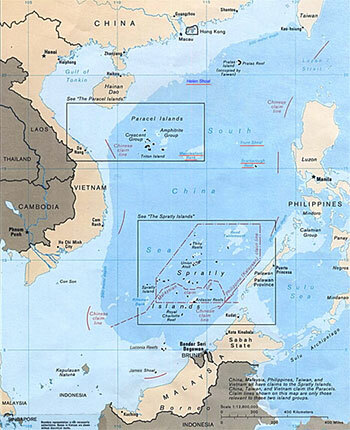 China has clearly been pushing its weight around of late, establishing a new administrative authority (Sansha) over the SCS in 2012, upholding a territorial claim (the “nine-dash line”) that embraces the entire disputed area, declaring an air-defense zone in the East China Sea, and forcibly seeking to remove Vietnamese and Filipino vessels from the contested areas. Making matters worse is the possible spillover of the China-Japan dispute over Senkaku/Diaoyudao, with Beijing seeing Japan as aligning with all the other SCS claimants against China and Tokyo seeing China’s assertiveness as further evidence that it’s a military threat. What might lie behind these latest Chinese and others’ maneuverings, charges, countercharges, and clashes? Clearly, energy needs are central to the sovereignty claims of the parties. One study finds that Vietnam is particularly reliant on oil imports at this time; its oil production peaked around 2004, and oil consumption exceeded domestic supply in 2009. The Philippines’ oil production is extremely low, and production has been flat for a long time. [i] It, too, looks to the South China Sea, among other sources, to meet its energy needs. Meanwhile, China’s needs are constantly rising, as evidenced by its global energy diplomacy that has taken it to every continent, including North America, to conclude oil and gas contracts. But China’s willingness to use force and threat to secure oil, and avoid international adjudication of the SCS claims, suggests other than purely economic motives. As the dispute with Japan has firmly established, China’s national identity has become deeply intertwined with territorial issues. Its assertiveness in support of sovereignty claims has strong support across the Chinese social spectrum, as much among young people as among defense intellectuals and the professional military. Similar nationalistic feelings may be at play in Vietnam, as the anti-Chinese riots suggest, and in the Philippines, just as they also have in Japan. The San Francisco Treaty System, which neither the People’s Republic of China nor Japan had a part in creating, has left a legacy of ambiguous maritime boundaries and multiple territorial claims that now have come home to roost. This is not to say that sovereignty claims are nonnegotiable, but it is to say that reaching agreement will involve hard bargaining. None of the parties, least of all China, wants to be perceived back home as having made excessive concessions for the sake of an agreement. Was China’s move into arguably Vietnamese waters also prompted by Obama’s pivot to Asia? That would seem beyond doubt. His four-nation trip last month, clearly meant to give substance to the pivot, seemed clearly to reflect a reevaluation, or rebalancing, of engagement with China. We hear much less about US-China partnership or interest in Xi Jinping’s notion of “a new type of great-power relationship,” and more about strengthening US alliances in East Asia, with deterrence of China the focal point. Even though Obama avoided offense to China during his trip, he and his national security advisers did not refrain from commenting on the SCS dispute—calling on the disputing parties to avoid military steps, respect freedom of navigation, and abide by international law, and urging China to avoid “provocative” steps. Such pronouncements would be innocent enough except for the fact that during his Asia trip Obama sided with Japan in the territorial dispute with China over the Senkakus (Diaoyudao) in the East China Sea, and pushed for an agreement with the Philippines (similar to one with Australia) to permit periodic US deployments to its former base at Subic Bay. It also doesn’t help the US position on China’s claim, that it should abide by the UNCLOS, when the US itself has not ratified UNCLOS. The United States needs to be careful about its involvement in the dispute. Putting it in the context of alliance politics antagonizes China and, more importantly, may create exaggerated expectations of direct intervention should the dispute take another violent turn. After all, the United States has multiple naval and air facilities at its disposal all over East Asia, whereas China has neither allies nor overseas bases. Obama has already possibly put US forces in harm’s way in the Senkakus/Diaoyudao dispute by accepting that the US-Japan Security Treaty covers those islands even though the US takes no (formal) position on sovereignty. The Philippines in particular may see an opportunity for “extended deterrence” here. To be sure, in Southeast Asia the desire has been expressed for some time that the US strengthen regional relationships so that China’s rise can be more effectively managed. But that view is not meant to suggest a US military confrontation with China. [ix] Having a larger nonmilitary presence in East Asia is one thing, backing friendly countries’ territorial claims with force, real or promised, is quite another. The United States cannot be an honest broker in the SCS dispute. Nor can it effectively preach freedom of navigation when its ships are monitoring Chinese naval activities in Hainan and elsewhere along China’s coastline. Washington’s influence might be most effective if it continued to encourage a diplomatic resolution, along the lines of Deng Xiaoping’s position of long ago on Diaoyudao: shelve the sovereignty issue and undertake joint exploration of resources. Washington should also acknowledge the importance of reaching agreement on a code of conduct (including one that the US itself could later sign), and should finally ratify the UN Convention on the Law of the Sea. [ii] See Mark J. Valencia, “China Bashing Doesn’t Help,” Japan Times, May 20, 2014. [iii] Zhu Dongyang, “Manila to Bear Consequences for Deliberate Provocation,” China Times, May 14, 2014. [v] “Xi: Asian Nations Voice Capacity of Taking Lead in Solving Asian Affairs,” May 22, 2014,http://english.peopledaily.com.cn/n/2014/0522/c90883-8730697.html. [vi] Carl Thayer has written a detailed history of the China-ASEAN negotiations. See Carlyle A. Thayer, "ASEAN’S Code of Conduct in the South China Sea: A Litmus Test for Community-Building?" The Asia-Pacific Journal, vol. 10, Issue 34, No. 4 (August 20, 2012). See Thayer’s recent Diplomat piece. [vii] The principles include self-restraint, respect for international law, peaceful settlement of disputes, nonuse of force, and non-alteration of the islands’ status quo. CBMs mentioned in the DOC include dialogue among defense officials, exchanges of information, and joint projects such as marine research and search and rescue operations. [viii] For these and other suggested inclusions, see Mark Valencia, "Policy Forum 11-41: A Code of Conduct for the South China Sea: What Should It Contain?" NAPSNet Policy Forum, December 08, 2011, http://nautilus.org/napsnet/napsnet-policy-forum/a-code-of-conduct-for-the-south-china-sea-what-should-it-contain/. [ix] See, for example, Dewi Fortuna Anwar, “An Indonesian Perspective on the U.S. Rebalancing Effort toward Asia,” National Bureau of Asian Research (NBR) Commentary, February 26, 2013.